Cafe Mocha and Zucchini Chocolate Cake at Flying Goat Coffee. I’ve become a big coffee drinker as of late, and I’m always on the lookout for a good coffee shop that serves an exceptionally strong cup. Sorry, but that wussy, watery excuse for coffee that so many cafes serve just isn’t cutting it. Enter Flying Goat Coffee. Located in Santa Rosa’s Railroad Square, it’s under some pretty fierce competition with neighboring coffee shops, but Flying Goat holds its own. Plus, with a name like Flying Goat, how can you go wrong? 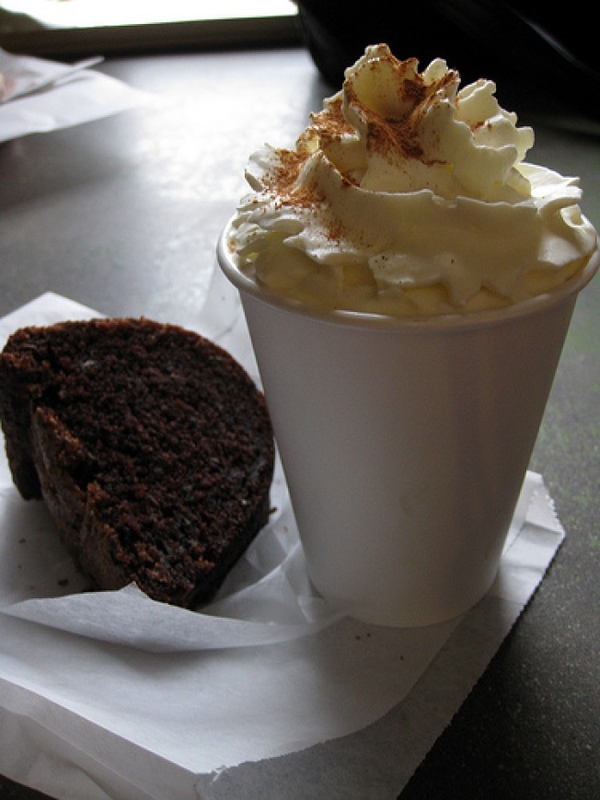 I had a cafe mocha with zucchini chocolate cake during my last visit and it hit the spot. You can actually taste the espresso and chocolate (unlike some other coffee shops, where a cafe mocha tastes like weak coffee mixed with Hershey’s cocoa powder). The chocolate cake was moist, crumbly and not too sweet, which I prefer. The people behind the bar at Flying Goat Coffee are meticulous in roasting and preparing each cup of smooth, strong coffee. The quality is consistent, the staff is well-informed and the venue is quirky and charming. In a town with a number of formidable coffee establishments, this is no small feat.